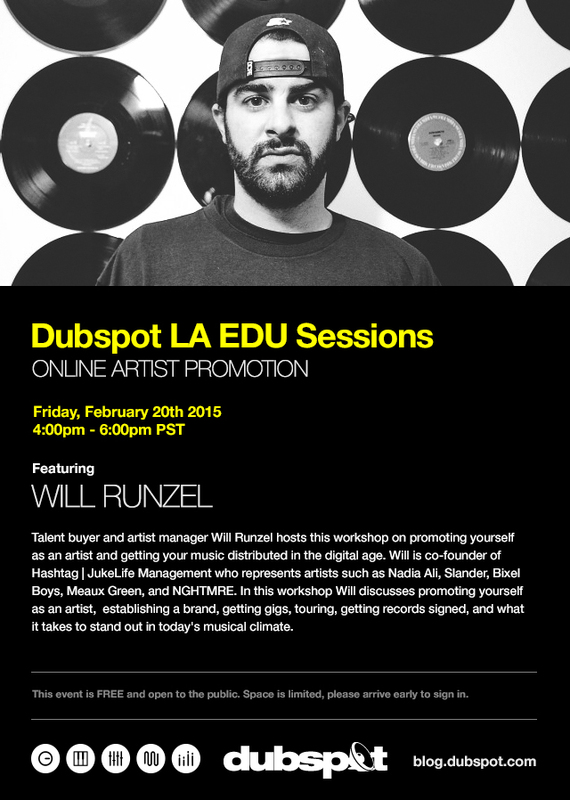 On Friday February 20th, theDubspot LA EDU Sessions continue with a workshop on how to promote yourself as an artist and getting your music distributed in the digital age. Join talent buyer and artist manager Will Runzel as he shares his insight about what it takes to make it in the music industry. Dubspot LA EDU Sessions welcomes artist manager, talent buyer, and PR whiz hosts this workshop on promoting yourself as an artist and getting your music distributed in the digital age as well as the realities of developing as a your act in North America. Will is co-founder of Hashtag | Jukelife who represents artists such as Nadia Ali, Slander, Meaux Green, NGHTMRE and more. In this workshop Will discusses promoting yourself as an artist, establishing a brand, touring, getting records signed, and it takes to cut through the fog in today’s musical climate. Will is co-founder of Hashtag JukeLife Management who represents artists such as Grammy nominee Nadia Ali, Bixel Boys, Slander, NGHTMRE, Bobby Puma, Meaux Green, Orange Is The New Black’s Taryn Manning and more. Catch Will’s Industry Spotlight Interview with Your EDM. Ask questions. Watch demos. Test drive workstations. Visit our New York and Los Angeles locations! Ask our Admissions Counselors in-depth questions about our programs, curriculum and philosophy. Watch live music production and DJ demos, and test drive our student workstations. If you are still trying to decide what you are looking for, stop by one of our Open Houses in NYC or schedule a tour in LA to find out more about the learning process at Dubspot. We can also help with scheduling details and payment options.